The Deriya Deniz is a magnificent hand-crafted 6-cabin Turkish gulet. Her original mahogany hull and finish has been beautifully complimented by the stylish alterations to her interior design introduced by her new Italian owners. She has 4 double and 2 twin cabins. Her broad beam and 24 metres length provides plenty of interior and exterior space in which to relax and watch the world drift by. We are extremely fortunate to be able to use such a beautiful vessel for our tours in Italian waters! Find out about our expert-led gulet charters in Italy. Boat VTR four m with out board motor 9,9 h.p. Dinghy with keel in VTR with out board engine 8h.p. Find out more about our Gulet Cruises in Italy. 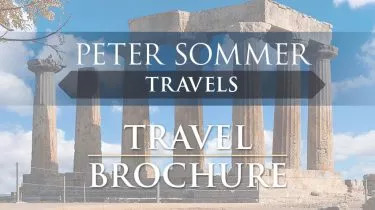 Peter Sommer Travels is a small tour operator that provides an intimate cultural and historical perspective on the places visited. The guides are all highly qualified archaeologists who are able to recreate vividly the past from the ruins before you. We have learned so much on each trip. It's like attending a week of lectures at the Smithsonian (Washington, D.C.) or a university but in the fresh air with the places before you. The Amalfi Coast gulet tour was coordinated exceptionally in every detail and led by highly qualified and knowledgeable guides. The tour provided a rich mix of visits to Amalfi Coast cities and sights along with opportunities to leisurely enjoy the Coast's vistas while cruising on our gulet. The gulet staff catered to our every whim, and ensured there were ample opportunities to swim while anchored off the coast. Comfort. Great food and drink. Fun and engaging conversations with fellow gulet cruisers. Highly, highly recommended! Peter Sommer Travels tours are exceptionally well organised with individual attention to every guest and trip detail. This is my fourth Sommer Travels tour and all have been most enjoyable, intellectually stimulating, and organised around areas and sites of tremendous interest. Every guest is treated as a long-time friend in a first class manner!